On Monday 14th May in collaboration with Inspire and the Irish Society for Autism we will be hosting a conference on autism. 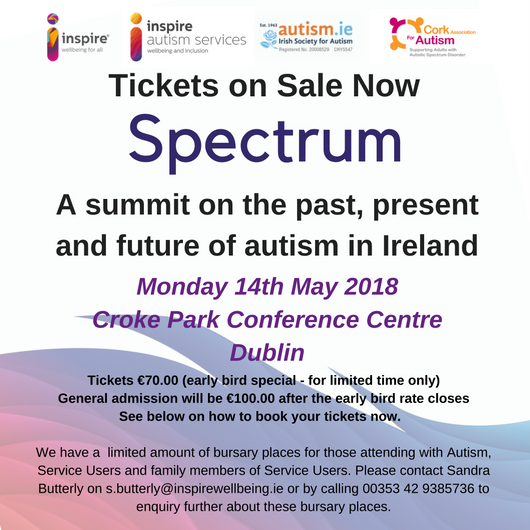 Spectrum – A summit on the past, present and future of autism in Ireland. Working together our three organisations aim to create a day to celebrate how far the movement for the inclusion of people with autism has come, reflect on current success and barriers to development and look to the future with optimism and determination. This pioneering conference will take place at the Croke Park Conference Centre, Dublin. The conference aims to attract decision makers, public representatives, commissioners, regulators, campaigners, human rights activists, service delivery organisations, health and social care professionals and people with autism and their families and carers. This will be an autism friendly event with sensory/quiet room, visual note taker, no background distractions and relaxed, conversational tone. 11.15: Table conversation and Question and Answer Session. 11.30: Autism Now: Panel discussion on the key issues facing autism services in Ireland today. We also have a limited number of free places for those attending with autism and/or carers. You can contact Sandra Butterly at s.butterly@inspirewellbeing.ie or by calling Sandra on 00353 42 9385736 to find out more about these places.